This monograph outlines a new perspective for the origin of language. Its central premise is that language’s arbitrariness was the main innovation causing language to emerge. Bouchard frames this thesis in the context of Saussurean theory and his own Sign Theory of Language (STL). Arbitrariness, then, is the thing that evolutionary explanations of language must seek to explain, and Bouchard proposes humans’ uniquely evolving Offline Brain Systems (OBS) as the main driver in the emergence of language. OBS are proposed by Bouchard to be uniquely human neural systems that are activated even in the absence of direct stimuli, allowing us to represent things not currently present. 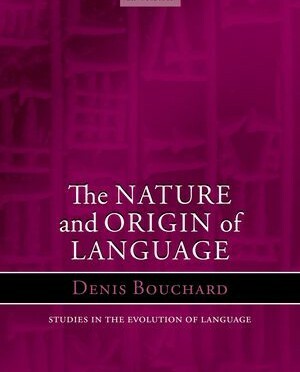 Throughout the book, Bouchard’s ideas are presented in opposition to ideas of the origins of language from a generative perspective, which I will cover in more detail throughout the review. The book is quite lengthy, but demands to be read from cover to cover in order to follow the arguments, and is not something that can be easily dipped in and out of, which is demonstrated by the use of acronyms which are mostly only glossed once and used in every chapter. For the most part, Bouchard’s approach is grounded in solid assumptions and repeats laudable sentiments in regards to having testable theories that minimise accounts of language-specific brain features. Bouchard’s book is wide-ranging and deals with evidence from neuroimaging, genetics, computational modeling and behavioural studies, but mainly focuses on evidence from linguistics. Given its breadth, I feel it is likely to generate backlash (or indeed interest) from specialists in more empirical fields, especially as the review of the literature is skewed to illustrate Bouchard’s theory. However, a multidisciplinary approach is unavoidable for any work in evolutionary linguistics and any tome written by an expert in a field is subject to an agenda. Readers must keep mindful of this. Bouchard’s work is presented throughout in opposition to ideas presented in work by Hauser, Chomsky and Fitch (e.g. 2002), who hypothesise that the great evolutionary innovation that allowed for language was “merge”, which is the ability to unify two disjointed items, and the connected capacity for hierarchical structure and recursion. Bouchard argues instead that the ability to arbitrarily connect signified and signifiers within signs was the great evolutionary leap that allowed for language. Furthermore, Bouchard argues that syntax is nothing more than a collection of combinatorial signs (c-signs), which negates the need to have a separate level of explanation for linguistic structure on different levels. Bouchard’s view is presented as being a dichotomy with the Chomskian perspective, that the emergence of syntax was triggered by the ability for merge, and that syntax is in some way special. However, both Chomsky and Bouchard’s perspectives, assert two different single elements that are unique and special to language. The book’s lack of discussion of recent work which lies outside of this (false) dichotomy, whilst dedicating vast swathes of pages to discrediting minimalist syntax, is where its shortcomings lie. Bouchard talks of “biolinguistics” and aligns the field with the views of Saussure based on his adoption of a “positivist approach” which advocates research based on “things that can be seen or proved rather than on speculation.” Whilst it is true that biolinguists generally align themselves with an empirical, evidence-based approach, a central tenet of this movement is that language is unique and special to humans, which often gets in the way of objective thinking, especially when it comes to evolution. Indeed, Bouchard continuously stresses the importance of an approach that limits the amount of linguistic-specific brain features we have, in order to more plausibly account for its evolution. The book wrestles with the question of whether complex thought patterns enabled language or vice versa, and argues that complex thought, in the form of Offline Brain Systems, pre-dated and enabled language. Bouchard outlines that OBS would have emerged as a result of increased connectivity in the brain that was not necessarily selected for language specific purposes. This seems a sensible and intuitive theory, however I worry that it is a little too vague to offer the desirable testability that Bouchard repeatedly claims to have pinned down. The book opens with an excellent overview of the basic perspectives currently present in the field of language evolution. For the most part, this introduction is thorough, and whilst the section is clearly written from a well-defined perspective, it still feels mostly objective. However, I found the section dedicated to language as a culturally-evolved system somewhat problematic, in that ideas regarding the social or sexual selection of language are conflated with research, such as Kirby’s iterated learning models (see Kirby, Smith &amp; Brighton 2003 for a review), which favours a narrative stressing the influence of cultural evolution on the emergence of linguistic structure. Tellingly, the only work by Kirby which Bouchard does cite in the context of computational iterated learning models, is the 2003 book “Language Evolution”, which is a broad introductory text. Including mechanisms of social or sexual selection in the section on cultural evolution neglects to clarify that these are processes of biological selection, not ones of cultural transmission. Bouchard points out that Kirby’s models give an idea of how simpler linguistic systems may evolve into more complex ones, rather than an idea of how language might have originated. However, he neglects to give much, if any, room to the research surrounding Kirby’s work that language may have emerged through general cognitive mechanisms and cultural transmission. This body of work, which is largely dominating the evolutionary linguistics community (as demonstrated at the 2014 EvoLang conference in Vienna) has more in common with Bouchard’s perspective on the origins of language, and yet is largely neglected in favour of the deconstruction of the generativist ideas of uniqueness and innateness, which many theorists have been discounting for years. Bouchard does dedicate a chapter to self-organising systems and stresses the importance of small cognitive biases and learning constraints in the emergence of combinatorial phonology, but spends little time on the effects that similar processes will have on syntax, and neglects to discuss any experimental work demonstrating these effects (e.g. Verhoef, Kirby and Padden, 2011). Bouchard spends some time in the next sections discussing Saussurean linguistics and newer empirical studies from neuroimaging, genetics and behavioural studies, but with notable gaps from the vastly expanding field of evolutionary linguistics. In the text, there is a notable lack of literature from more recent years. He dedicates a huge amount of discussion stressing the importance of the design feature of arbitrariness in language with only a very brief fragment (one paragraph) addressing evidence that suggests that language might not be a purely arbitrary system. This massive oversight is problematic in a book of such length, especially given that this book is about the origins of language, and given the fact that there is so much work which discusses iconicity facilitating the bootstrapping of communication systems in order to solve symbol grounding problems. Furthermore, a serious body of work that suggests that systematicity between signals and meanings can facilitate language learning exists (see Perniss et al., 2010 for a review and Monaghan et al., 2014 for a more recent update). Though these claims remain controversial, I feel that given the main premise of the book and its argument, these issues deserved serious discussion, which they did not receive. 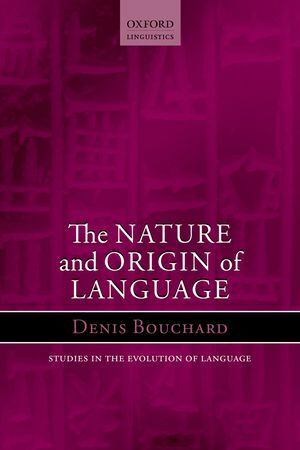 Bouchard also briefly asserts that the origins of language are independent of the linguistic modality (either speech or gesture) that was initially used for language. However, given that his theory is grounded so deeply in language’s arbitrariness, it feels strange to neglect a serious discussion about how a linguistic modality can affect the amount of iconicity possible in language, and in addition, how this can affect structure that emerges from a linguistic system, because, as Bouchard points out himself, “the possibilities of the chaotic system are considerably narrowed by material properties of our production systems” (page 154). Though Bouchard is talking about the controllability of a production system, he must have considered the effects of modalities which lend themselves more easily to iconicity, and that this will necessarily affect the structure of any system that emerges from different modalities. The book rounds off with a lengthy chapter outlining inconsistencies within current minimalist theories of syntax accounting for linguistic complexity (mostly within modern English). The chapter outlines how Bouchard’s Sign Theory of Language can reformulate our understanding of language in order to overcome these problems. Whilst this fits with Bouchard’s overarching narrative, it still seems somewhat disjointed from the discussion on language origins. Especially given Bouchard’s earlier dismissal of work which looks at how less complex linguistic systems can adapt to gain complexity as not being relevant to language origins, it seems strange to dedicate such a chunk to accounting for modern linguistic complexity. This is a highly interesting, well-researched and well-written book. I would recommend it to researchers and students interested in the study of language evolution. However, I would be concerned if students read this as an introduction to the field, as I do not feel that the whole scope of current and relevant research is represented. Still, some very interesting theories are presented which deserve attention, and one hopes that those working in more empirical fields might take the time to consider their findings in relation to Bouchard’s theories. Bouchard, D. (2013). The nature and origin of language. Oxford University Press. Kirby, S., Smith, K., and Brighton, H. (2004). From UG to universals: linguistic adaptation through iterated learning. Studies in Language, 28(3):587-607. Monaghan, P., Shillcock, R. C., Christiansen, M. H., and Kirby, S. (2014). How arbitrary is language. Philosophical Transactions of the Royal Society B.
Perniss, P., Thompson, R., and Vigliocco, G. (2010). Iconicity as a general property of language: evidence from spoken and signed languages. Language Sciences, 1, 227. Verhoef, T., Kirby, S. and Padden, C. (2011) Cultural emergence of combinatorial structure in an artificial whistled language. In L. Carlson, C. Hölscher and T. Shipley (Eds. ), Proceedings of the 33rd Annual Conference of the Cognitive Science Society (pp. 483-488). Austin, TX: Cognitive Science Society.